Does anyone has configured DHCP option in Cisco Switch for OS Deployment. We are trying to setup the DHCP pool by creating a seperate VLAN for OS Deployment and set all the option 60,43, 66 and 67 . But could not get through . We have set this option in different combination like only setting 60 & 43 . (it didnt work ) then adding 66 and 67 as we are targetting UEFI targets still it didnt work. Does anyone have experience or have inputs on this ? Please let me know if you require more information on this. 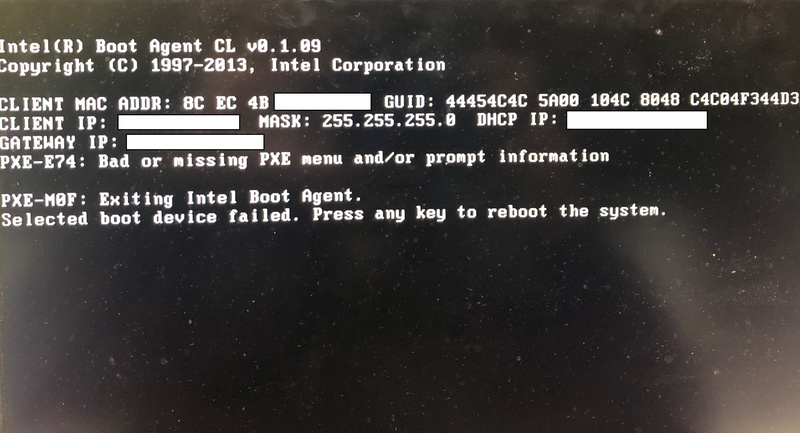 What do you see on the client when you try to PXE boot? That will help determine where the problem occurs. Also what OS is your DHCP server? As i am doing imaging for Laptops (UEFI targets) i tried setting up 66 and 67 along with 60 & 43 but it does not work the target does not get DHCP ip itself “No DHCP or DHCP proxy”. When i remove 43 option and keep 60 ,66 and 67 i get error “TFTP Open Timeout”. option 43 ascii "IP-Address of OSD"
option 66 ascii "IP-Address of OSD"
66 and 67 for UEFI targets. They should not conflict among them but I suggest to try to set a pair per time for problem determination. Could you please try to set only options 43 and 60, PXE boot a legacy (BIOS) target and send the output on the target screen and, after removing them both, to set the options 66 and 67 and boot a UEFI target and send the target screen? I tried both the options following are the option what i set. Note: This settings are done on same Laptop its a UEFI targets. The other option as it is UEFI target laptops. it seems to me that both the times the target booted in BIOS (Legacy) mode and not in UEFI mode, so the options 60 and 43 are the ones to be used. 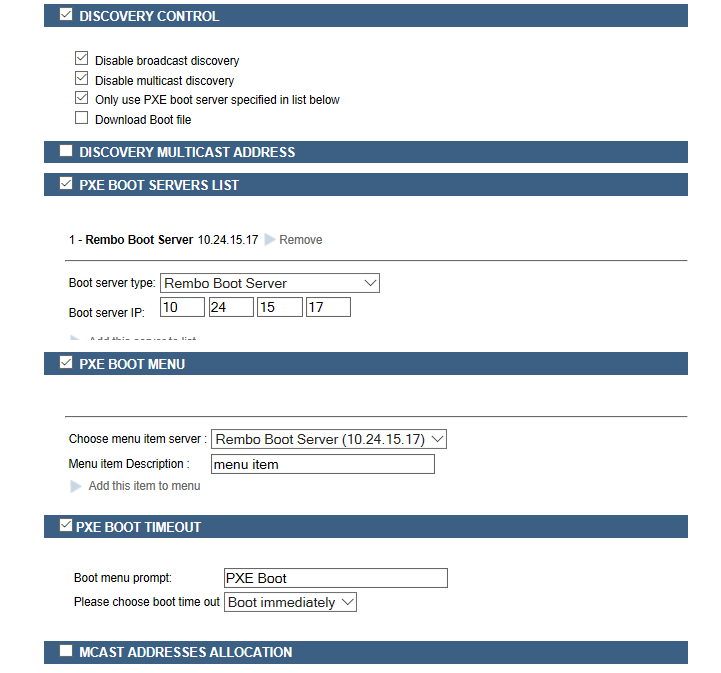 For the first PXE boot where you had the error “Bad or missing PXE menu…” I think that the option 43 could be not correctly set, for the second PXE boot, the issue seems to be that the options are missing. When I plug in your value I get an error. If you don’t mind my asking, what format is that? Or rather…why does your “hex” contain “y” and “g” characters? In the Cisco IOS Switch we are setting this value . in the previous chat which i mentioned the value i changed . the way it appears in the cisco switch is mentioned above. I think that option 08 is not correct, maybe the final “0A” is wrong. It’s declared as 7 bytes log but it’s 8. A list of IP addresses, each address corresponding to one PXE server (when discovery_control is unicast). A PXE server is identified by a number (the standard value for Tivoli® Provisioning Manager for OS Deployment is 15) and its IP address. The format of this option is two bytes for the server type (15 for Tivoli Provisioning Manager for OS Deployment), one byte for the number of servers to list (1 in our example), and four bytes per server address. Which is the source information filled in the form? below is the information which is set based on this following output has come. Could you try with this? I did it following indications at the link. this worked. i can see the PXE boot happening. Please, let me know if some of the options are not clear and I’ll provide more details.